Nautilus Terminal - a Nautilus extension that embeds the terminal into the Nautilus window -, finally works with Nautilus 3. This is actually a full rewrite of the original Nautilus Terminal, for Nautilus 3.x. The new Nautilus Terminal follows the navigation automatically (auto "cd"), you can copy / paste (Ctrl+Shift+C / Ctrl+Shift+V), supports drag & drop of files and folders and is resizable (height). Currently there is no GUI to configure Nautilus Terminal, but you can create a config file with various settings. 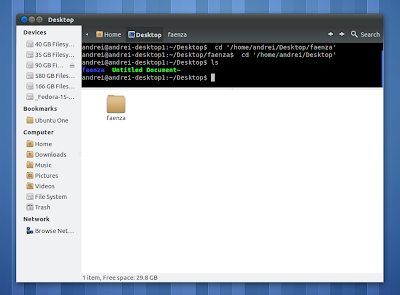 Also, the terminal can be toggled on/off using using a keyboard shortcut (F4). Everything should be pretty self explanatory so modify the settings to suit your needs, then save the file. Nautilus Terminal should show up by default when opening Nautilus. To set it to start hidden, see how to configure it above. If you're not using Ubuntu, download the latest Nautilus Terminal 1.0 from HERE. Report any bugs you may find @ Launchpad.